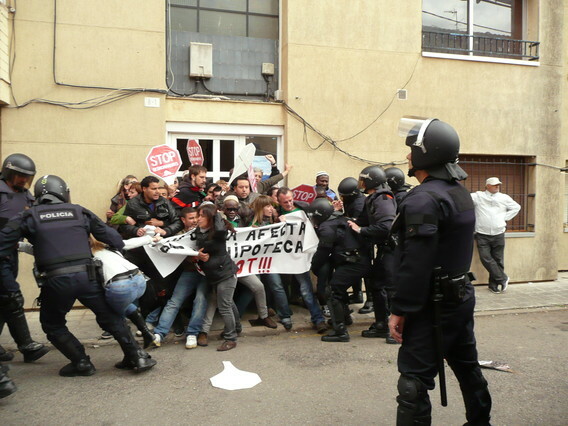 The PAH, Plataforma de Afectados por la Hipoteca, predating the emergence of 15M in spain has been, with 15M’s neighbourhood assemblies in various cities, been one of the most emblematic protagonists in the popular efforts to resist the power of the State – banks. The PAH provides legal counselling to those threatened by home expulsion, it has been actively engaged in efforts to reform the legislation covering evictions and home mortgages, while promoting social housing, and has consistently organised physical resistance to evictions. The latter are not only acts of great courage and generosity, they are schools of solidarity, showing to all who care to see what collective action can accomplish against the power of Capital. And perhaps above all, such resistance challenges the supremacy of private property legally and ideologically, opening up a critical space for imagining human communities beyond capitalism. This entry was posted in Commentary, News blog and tagged 15M, Okupations, Plataforma de Afectados por la Hipoteca, spain, Spanish Revolution. Bookmark the permalink.